Create your designs and display your artistic work on this table top free standing display board. 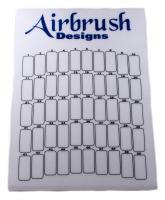 The display board is made of white acrylic and has room for 40 nail art designs (individually numbered). Attach your nail art design tips to the board using either double-sided tape, Blue Tack (reusable soft pliable adhesive) or any sticky tapes. 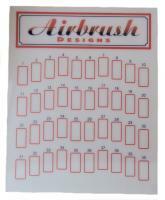 Create your designs and display your artistic work on this table top free standing display board. 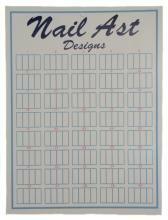 The display board is made of white acrylic and has room for 50 nail art designs (individually numbered). Attach your nail art design tips to the board using either double-sided tape, Blue Tack (reusable soft pliable adhesive) or any sticky tapes. Create your designs and display your artistic work on this wall mount display board. 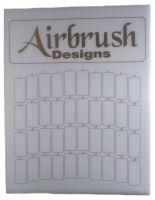 The display board is made of durable white plastic and has room for 160 airbrush designs (40 numbered groups). Attach your nail art design tips to the board using either double-sided tape, Blue Tack (reusable soft pliable adhesive) or any sticky tapes. 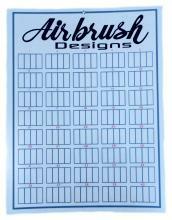 Create your designs and display your artistic work on this wall mount display board. 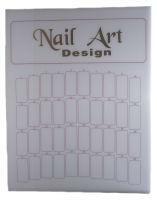 The display board is made of durable white plastic and has room for 160 nail art designs (40 numbered groups). Attach your nail art design tips to the board using either double-sided tape, Blue Tack (reusable soft pliable adhesive) or any sticky tapes. 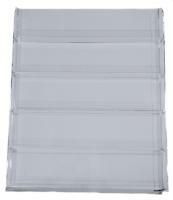 Organize and display your nail polishes with a professional looking heavy duty clear acrylic counter display. 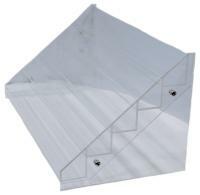 This 5-tier step is a free standing unit and comes with hardware for assembly. Organize and display your nail polishes with a professional looking heavy duty clear acrylic wall mount display. 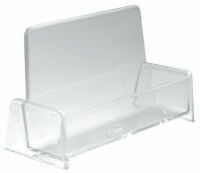 Organize your nail tips and accessories with this clear acrylic box. Desktop business card holder. Made of clear acrylic to allow easy viewing. Opening dimension: 3.75"x0.875"